Please forgive me. I haven't participated in the Tuesday's With Dorie entry's in two weeks! I've been so busy and totally baked out between BBQ's, birthday's and what have you. I'm leaving for California on Friday and won't be back until mid next week. However, I'm going to do my best to make next week's recipe, Black and White Banana Loaf, chosen by Ashlee of A Year In The Kitchen. I'm going to visit my brother who has informed me that his kitchen doesn't work. Um, what does that even mean? How do you not have a functioning kitchen? I will have to make do because I've been dying to make this banana loaf so stay tuned! Check out TWD for all the entry's from this week! P.S. Please disregard Marley's haircut--he's the little one in front who looks like the Taco Bell dog. I had no choice but to shave him because he was all matted and I'm so NOT OK with his new do...eeeek! This was my first time experimenting with fondant, also known as sugar paste. I had planned to take a cake decorating course on fondant but life kind of got in the way. A very good friend of mine is celebrating a birthday next week and all fingers pointed to me for the birthday cake. Of course, I'm happy to do so, only this time, I'd like to make a tiered cake covered and decorated with fondant. I've been reading an introductory book to fondant and thought I'd give it a try. So, I set off to make a red velvet cake from one of my new books, Cakes Galore by Phillipa Vanstone and Valerie Barrett. This project didn't have me so concerned with the actual cake, but more so with the decorating aspect. Rather than making this about the cake, I wanted to focus on the aesthetics! With that said, this red velvet happened to have been delicious. I made 4 layers, filled with cream cheese icing and, according the my book's directions, smeared a crumb coat around the sides and top, allowing it to set slightly to a tacky, sticky consistency. I bought ready to use rolled fondant from my local Michael's and began my adventure. 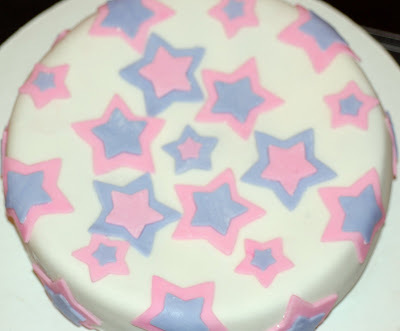 After covering the cake with the white fondant, I colored it using pink and purple coloring gels and used my fondant star cut-outs to create the different sized stars. In closing, this wasn't as hard as I thought it would be. I realize my first fondant cake is nothing to gloat about, but I now have the confidence to create a fantastic birthday cake for next week. Keep in mind, I'm a fondant virgin! Keep in mind, I'm a fondant virgin! I am going to bake the different sized layers (10in, 8in, 6in) for my friends birthday this weekend and begin decorating on Sunday. I've mapped out a plan for this! I'll be sure to post when it's all finished. Wish me luck!! Your thoughts on the cake? Leave a comment and/or suggestion! Alwayz Bakin' and Baking With The Boys both tagged me for meme's! For what a meme is and the rules that go along with it, check out my last meme post here. I looked at each meme's questions and decided to go with Alwayz Bakin's meme! OK, off to questions..
Baby Mama with Tina Fey in APRIL! That's embarrassing coming from a movie buff.. I'll just stick to the fiction side of this question being that I'm reading several cook books simultaneously! "Babyville" by Jane Green. Is it safe to say this meme is pretty much directed at women? No Maxim option? I would have to go with US. I love the smells of Fall. Pumpkin spice, cinnamon, etc. This has to be at Shea stadium with a packed crowd, bases loaded in the 9th for a walk off win! The place goes CRAZY. If I'm being honest, my exact words every morning are: "I hope my puppies held it in..." HaHa. They are only babies!!! Hmmm...I live in Manhattan and I have soooooo many favorites! I'll keep it simple and go with the diner on my corner...I literally eat there Monday-Friday of every week. Yup, I love that place. To put it simply, I don't drive without my radar detector. That's a toss-up between football, baseball, and soccer. Under the sun in Florida. Definitely Florida. The last dessert I brought to the BBQ was this Brownie Mosaic Cheesecake. I found this recipe on Smitten Kitchen and oh boy am I happy I did! This was AMAZING. I repeat, AMAZING. Anything bound together by brownies and cheesecake can't possibly disappoint! The cheesecake came out like a gem. There were no cracks, slits, or dents; it was completely blemish-free. Every bite had rich chunks of chocolaty brownie. This cheesecake was extremely rich and I ended up taking home 3/4 of it, where it will be served this weekend at another BBQ! While this cheesecake involves two different recipes (the brownies and the actual cheesecake) it was fairly easy to make and ended up being a 2-day process. This recipe is referred to as a "one bowl" brownie recipe. Enough said? It's super easy, super fast, super delicious and requires super easy clean-up! Basically it's all out "super". I made these a day in advance and put the uncut sheet of brownies in the fridge to cool overnight. After cooling and refrigerating overnight, I sliced the sheet of brownies into 1x1 inch cubes using a pizza cutter. I would highly recommend using a pizza cutter; this made the process much easier and created no crumbling. Finally, I was ready to make the cheesecake which had a base/crust of crushed chocolate teddy graham's. I've never used such a cookie as a crust, but let me tell you, this won't be the last time! Smitten Kitchen gives recipes for both a single and double crust. Naturally I stuck with the double crust because a girl can't get enough crust in a cheesecake! The actual cheesecake portion of this recipe was so easy. Cream cheese. Eggs. Vanilla. Sugar. That's it! When the cheesecake filling is poured into the crust you gently fold the brownie cubes in and bake! Once cooled, the cheesecake is topped with ganache filling (which I altered, see below) and you have yourself a beautiful impressive brownie cheesecake! I had extra brownie cubes left so I crumbled them up and garnished the top of the cheesecake with them. This cake is sure to impress your friends, co-workers, family member, etc. I highly recommend this cheesecake to everyone!! Preheat oven to 350°F. Line 13×9-inch baking pan with foil, with ends of foil extending over sides of pan. Grease foil. Microwave chocolate and butter in large microwaveable bowl on HIGH 2 min. or until butter is melted. Stir until chocolate is completely melted. Stir in sugar. Blend in eggs and vanilla. Add flour and salt; mix well. Spread into prepared pan. Bake 30 to 35 minute or until toothpick inserted in center comes out with fudgy crumbs. (Do not overbake.) Cool in pan on wire rack. Remove brownies from pan, using foil handles. Cool brownies, then cut* them into 3/4- to 1-inch squares for use in the cheesecake. You will have more than the two cups of cubes, loosely measured, than you will need, and I’m sorry, you’re just going to have to decide for yourself what to do with the extra. Add cubes to cake batter as directed below. * I find that brownies are fantastically easy to cut once they’ve been refrigerated–you end up with nice clean lines, and in this case, a sharp pizza wheel was especially helpful. Also, brownies taste better cold. I’m just saying. I like a doubled crumb crust. I can’t get enough cookie. Below are proportions for one crust with the amounts to double the recipe in parentheses. You know you wanna. 1 1/2 cups or 5 ounces (3 cups or 10 ounces to double) finely ground cookies such as chocolate wafers. Or Chocolate Teddy Grahams. Grind the chocolate into powder in the food processor, scald the butter and cream in a saucepan (or in a Pyrex cup in the microwave). With the machine running, pour the hot cream/butter mixture slowly through the feed tube onto the chocolate. Blend until completely smooth, stopping machine to scrape down sides once or twice. Add the extract and sugar and process until smooth. Spread over cheesecake while ganache is still warm. Chill until ready to serve. The next dessert I made for the BBQ were Chocolate Mint brownies. I've wanted to make these for quite some time now and rather than making plain boring chocolate brownies I decided to give these a shot. I've made chocolate mint cupcakes and now it was time to experiment in the brownie department. I got this recipe from Joy of Baking which is a fantastic site. This brownie consisted of a dense moist brownie layer followed by a mint icing layer then topped off with chopped Andes mints. These were so good that I had to leave 1/2 the batch at home for my family to enjoy. That was an order. I didn't make any revisions to this recipe except the addition of chopped Andes mints. I've seen Andes baking bits on other sites however I can't seem to find them in my supermarkets anywhere! So, I chopped up a package of them and they added the perfect umph! Preheat oven to 325 degrees F (160 degrees C) and place the rack in the center of the oven. Have ready a 9 x 9 inch (23 x 23 cm) square baking pan that has been lined with aluminum foil across the bottom and up two opposite sides of the pan. Set aside. Chocolate Glaze: In a heatproof bowl over a saucepan of simmering water, melt the chocolate and butter. Spread over the mint filling and refrigerate for about 30 minutes or until the chocolate glaze starts to dull. If you decide to use the chopped Andes mints, sprinkle them on top before you refrigerate. To Serve: Remove the brownies from the pan by lifting with the ends of the foil and transfer to a cutting board. With a sharp knife, cut into 30 squares. It is a good idea to wipe your knife between cuts with a damp cloth. These brownies can be stored in the refrigerator for several days or else frozen. Makes about 30 1-inch (2.5 cm) squares. 1) I. LOVE. S'MORES. End of story. 2) I have been jumping at the opportunity to use my new blow torch but have yet to find a recipe that required it. 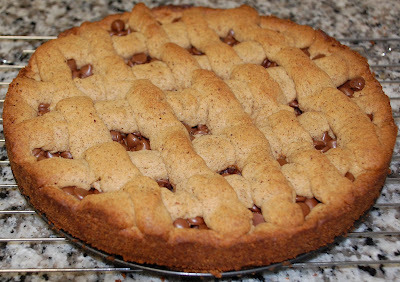 3) My friend Ed repeatedly insisted I make this pie and I couldn't disappoint. 4) I love making marshmallow meringue. 5) I think that's enough reasons...no? My friend Julie with the PIE! You can also use a kitchen blow torch rather than the broiler. That's what I did. Marshmallows. Chocolate. Graham Crackers. 'Nuff said? Three ingredients uniting together to create a sublime flavor so good that it causes your taste buds to do flips! Super S'More Crisps is what Elinor Klivans likes to call these bad boys. I got the recipe from her book, Big Fat Cookies, and thought they would be the perfect treat for a friend's BBQ tomorrow. S'mores are a classic treat for summer BBQ's and rather than making actual S'mores using whole graham crackers, whole squares of chocolate, and a jumbo marshmallow all to be roasted over a fire, I thought these cookies would suffice. This was a very crispy cookie with loads of chocolate packed in. Three cups of graham crackers are added to the recipe creating a thick dough and lastly, the marshmallows, once baked, carmelize giving a crunchy toffee-type of taste. Rather than dolloping on the chocolate coating I took a pastry bag, cut a small hole at the tip, and zig-zagged the chocolate on. I also used semi-sweet AND milk chocolate chips to vary the taste a bit. These are so good! I would encourage everyone to make this creative take on S'mores! MAKE THE COOKIES: In a large bowl, using an electric mixer on medium speed, beat the butter and sugar until smoothly blended, about 1 minute. Stop the mixer and scrape the sides of the bowl as needed during mixing. Add the egg and vanilla, mixing until blended, about 1 minute. On low speed, mix in the graham cracker crumbs, flour and salt until a soft dough forms that come away from the sides of the bowl. Mix in the chocolate chips and marshmallows. Using an ice cream scoop or a measuring cup with a 1/4 cup capacity, scoop portions of dough onto the prepared baking sheets, placing them 4 inches apart. Flatten each cookie slightly to about 3/4 inch thick. Bake one sheet at a time until the tops feel firm and the marshmallows near the edges of the cookies have melted and become clear and carmelized, about 15 minutes. (Some of the marshmallows in the center will remain white.) Cool the cookies for 5 minutes on the baking sheets, then use a wide metal spatula to transfer them to wire rack to cool. MAKE THE CHOCOLATE COATING: Put the milk chocolate and oil in a heatproof container or the top of a double boiler and place it over, but not touching, a saucepan of barely simmering water (or the bottom of a double boiler). Stir until the chocolate is melted and smooth. Remove from the water and let cool and thicken slightly, 15 to 20 minutes. Use a small spoon to drizzle the chocolate coating over the cooled cookies. (I used a pastry bag, cut a hole at the tip and zig-zagged the chocolate on). Leave the cookies at room temperature until the chocolate is firm, about 1 hour. Or refrigerate the cookies for about 15 minutes. The cookies can be individually wrapped in plastic wrap an stored at room temperature for up to 2 days. Melissa from It's Melissa's Kitchen (no, not my kitchen) picked this week's TWD recipe. She went with chocolate pudding which is definitely a feat I've been trying to master. After 3 failed attempts with this pudding, I finally got it right and when it's right, it's right. I used all semi-sweet chocolate rather than the suggested darker bittersweet which is why my pudding looks lighter and milkier than the other TWD'ers. It was a creamy, chocolaty, silky pudding that could be paired with just about anything. Throw in some sliced bananas, chopped chocolate candy, fruit of any kind, chocolate chips, heath bar, or even just a dollop of whipped cream. There are endless opportunities to spice up this chocolate pudding but the best part is that it is just as delicious plain. Dorie Greenspan has done it, yet again! All of her recipes have proven to not only work, but taste as delicious as the enticing photographs make them out to be. Check out the other TWD blogroll, here! I went baking-book happy at Border's this past week. I met a friend for dinner Thursday night and she was running a few minutes late. To my surprise, Border's was located directly above the restaurant so I hit up the baking aisle immediately. I left there 5 books deep and $100.00 poorer. So it goes...One of the many books I purchased was The Essential Chocolate Chip Cookbook by Elinor Klivans. I have a few other books by this author including Big Fat Cookies and Cupcakes! She is totally awesome. Her books offer gorgeous photos, tempting recipes with wonderful flavors, and in depth explanations/directions for each recipe. Every recipe I've made from these books have come out perfectly and delicious. I was a feature interview at the Cupcakes Take The Cake site!!! This was such an exciting opportunity! Check it out here! Woooooo! Anyway, here are some pictures from last night. I didn't have my awesome Nikon camera on me because it's to heavy to schlep around so I used my dinky little digital camera. Enjoy! this one. Why in the world would you eat the entire slice and leave out the best part? This pained me to see! That SMBC took me 20 minutes to make! Shame on you! ha. As mentioned in my earlier posts, my cousin is a writer, comedian, and producer living and performing in New York. He is the creator/producer of the NYC cult hit show, The Rejection Show, as well as the New York City Beard & Moustache Championships, The Delicious Sandwich Social,The ECNY Awards and many other popular live events. Tonight is the season finale of the Rejection Show and he asked me to bake a birthday cake for one of the many performers at tonight's show. Naturally I agreed in a heartbeat and got to work. This was a 2 day process as all layer cakes should be. 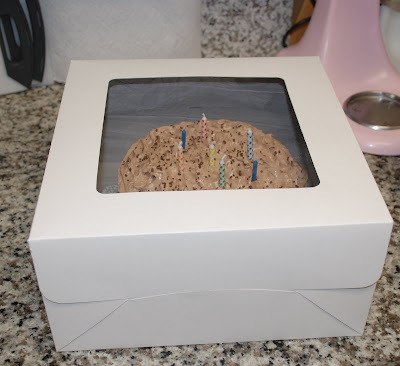 From here on out I will bake the cakes/layers on day 1, wrap it up in plastic wrap and freeze overnight. Day 2 will involve the decorating. Anyway, while brainstorming, I knew I wanted to involve Billy's Vanilla Vanilla cupcake recipe, but in cake form, found here. These cupcakes were just too damn delicious to not use as my basic "go-to" vanilla cake. Since I was unable to take a picture of a slice of the cake, (it would be rude to bring an already-eaten cake!) above is a picture of the 4 layers with pink special vanilla buttercream in between. Since the birthday is celebrated by a woman I thought I'd throw in a touch of pink! After the show tonight I will try to snap a few pictures of a slice! I frosted the entire cake with the most amazing Nutella Swiss Meringue Buttercream. I really don't like buttercream at all. I think it's way too thick, sweet, and is only good for piping, in my opinion. However, the SMBC is seriously outrageous. It's silky and smooth and finishes off a cake so glamorously. It tastes amazing also! Despite taking more time to prepare than regular old buttercream, it's very well worth it. Trust me! The added Nutella gave it a chocolaty-almond taste which was ridiculously delicious. I peaked the top of the cake and sprinkled chocolate flakes. I really can't wait to taste this cake tonight! I'll give ya'll an update tomorrow; hopefully with a few cross-section pictures. Happy birthday Michelle! Boxed up and ready to go! 1. Cream shortening until fluffy. Add confectioner's sugar and continue creaming until well blended. 2. Add salt, vanilla, and whipping cream blend on low speed until moistened. Add additional whipping cream if necessary (up to 2 ounces). FINALLY! From the day I purchased the book, "From My Home To Yours", by Dorie Greenspan, I ogled this recipe while simultaneously wiping the drool from my mouth. Amy from South In Your Mouth picked this week's Dorie recipe: Double Crusted Blueberry Pie- a.k.a. Blueberry heaven! I. Love. Blueberry. Pie. I'm not such a huge pie fan in general, but Blueberry pie could be my all time favorite, for sure! Pair it up with some vanilla ice cream and it most certainly could bear some resemblance to heaven. I really enjoyed this recipe, especially the addition of the lemon rind and juice, which I ended up doubling; giving the pie a great tart flavor. The pie dough was easy, quick to make, and very pliable to work with. I had some extra dough so I made flowers to garnish with as well as a mini strawberry pie! It was delicious! If I haven't already made it clear, this pie was so tasty. I paired it with vanilla ice cream and served it for my 4th of July BBQ which comprised of Chinese take out and wine! Thankfully there was one item of food on the table that was 4th of July-worthy! Check out the other TWD'ers pies. Thanks Amy for choosing this amazing recipe! Wow. Last night I experienced my first dose of baking frustration. I just bought the book Cupcakes! by Elinor Klivnas and tagged several recipes (OK, basically the entire book) and thought I'd make the Chocolate Hi-Hat cupcakes with an independence day theme. Well, this plan clearly isn't pictured above. After 3, yes 3, failed attempts at making the Swiss meringue- type marshmallow fluff frosting I thought I finally got it. The 4th attempt was peaking and thickening the way it was supposed to. I know this because I made this exact type of frosting last week when I made Billy Reece's vanilla cupcakes so I knew I was capable of success! The directions say to pipe the frosting on the cupcakes in a cone like shape 2 inches high. All went well with this step as I was feeling good about the outcome. I put the piped cupcakes in the fridge while I made the chocolate dip. I used semi sweet chocolate as well as red, white, and blue melting chocolate. The directions then said to hold the cupcake by the bottom and dip into the chocolate, allowing the chocolate to drip off. Here's where my night of cupcake'ing went down the drain. As I dipped each cupcake, one after another, it's as if the frosting melted right off and landed in the bowl of chocolate, creating a monster mess. It was after midnight at this point and I decided to fore go salvaging my beautifully peaked frosting and spooned large amounts of colored chocolate over the cupcakes, garnished with sprinkles, and topped off with festive toothpicks. I brought these into work today and everyone loved them. They tasted great despite the unexpected failed appearance. I will most definitely take another stab at these down the road, but not until I try all the other fabulous recipes that this book has to offer!